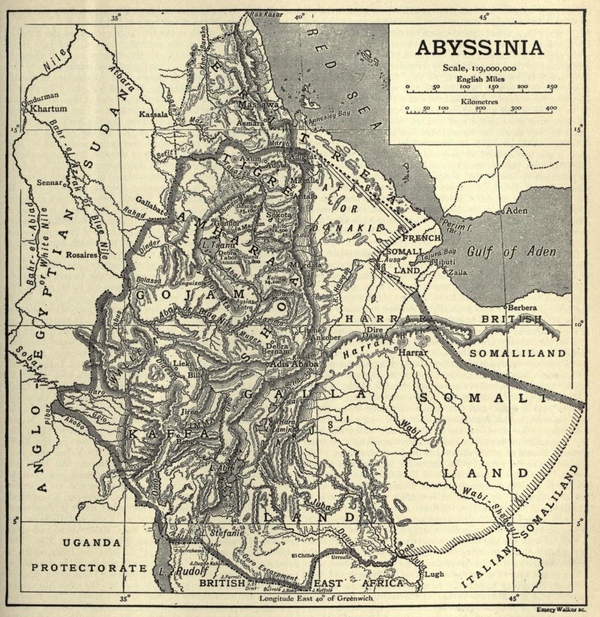 Vintage, public domain map of Abyssinia from a 1911 encyclopedia. Like so many vintage maps, this one represents a country that no longer exists. Abyssinia was also known as the Ethiopian Empire and included what we now call Eritrea and the the northern half of Ethiopia. It existed for over 800 years (1137-1974). This vintage map shows that the area was landlocked and had a wide range of topological features. The encyclopedia identified coffee as one of their primary exports which it continues to be today. Click on the image to retrieve a larger version of the vintage map of Abyssinia.